This ingenious combo bike safety light makes bikers more visible, even in blind spots and road crossings. Compared with cars, bikes are small and quiet. It's part of why we love them. But it also makes it harder for drivers and pedestrians to notice cyclists. This ingenious combo light makes biking safer by enlarging cyclists' visible footprints in blind spots, crossings, and other places where they tend to go unseen. Using laser projection technology, one light beams a several-foot-wide green bicycle image on the ground a few yards ahead of the real bike. The visual early warning gives drivers an extra second or two to step on their brakes or swerve out of the way if necessary. The other light puts out a 300-lumen beam that'll illuminate a bike path at midnight and make sure you're seen at high noon. "Get me home" mode extend the 13-hour battery life by 4 hours when the charge drops low. Encased in aircraft-grade aluminum, it's fully waterproof. 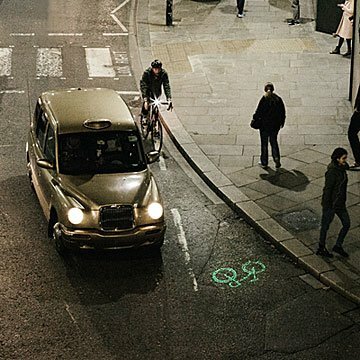 The patented laser projection technology has been independently tested by the Transport Research Lab, and is used on the entire London bike share fleet. Quick-charge USB cable and mounting hardware included. Made in China. Lithium Battery contained in product.